In his own lifetime, Geoffrey was considered the greatest English poet, and the centuries have not dimmed his reputation. With a single exception of William Shakespeare, no English writer has surpassed Chaucer’s achievements. His unfinished masterpiece, The Canterbury Tales, ranks as one of the world’s finest works of literature. It also provides the best contemporary picture we have of 14th century England. Although the exact date of Geoffrey’s birth is unknown, official records furnish many details of his active life as a public servant. His father was a well-to-do wine merchant in London, a man with sufficient influence to secure young Geoffrey a position as page in a household connected with that of King Edward III. As a page Chaucer’s duties were humble, but the job provided him an opportunity to observe the ruling aristocracy, thus broadening his knowledge of the various classes of society. In 1359, while serving in the English army in France, he was captured and held prisoner. The King paid 16 pounds ransom for his release. In 1366 Chaucer married a lady-in-waiting to the Queen. 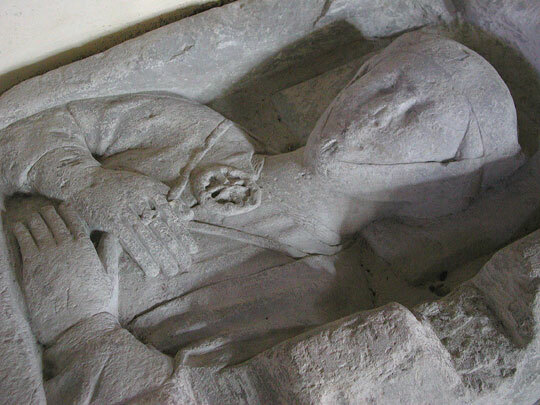 His marriage to Philippa Pan lasted until her death in 1387. Scholars believe that Chaucer and his wife had 3 children. Their, eldest Thomas, was apparently ambitious and advanced higher in the world than his father had, Little is know about a son, probably called Lewis, and a daughter called Elizabeth. Throughout his life Chaucer served in key government positions. He was controller of customs, a justice of the peace, and a one term member of Parliament. He spent time in France and Italy on diplomatic missions, served as a supervisor of construction and repairs at Westminster Abbey and the Tower of London, and late in life, acted as a subforester to the King’s Forest. I might seem that Chaucer has little time for writing, but in fact he was able to produce a great deal. He began writing poetry in his twenties and continued to do so the rest of his life. Moreover, as he grew older, his literary works showed increasing depth and sophistication. In Troilus and Criseyde, a long poem dealing with themes from classical antiquity, he displays the dramatic flair and penetrating insight into human character that are his hallmarks. The Canterbury Tales, of which only 24 of the projected 124 tales were completed, shows Chaucer’s absolute mastery of the storyteller’s art. Chaucer was the first person to buried in what is now the poet’s corner of Westminster Abbey. People in Medieval England sometimes made pilgrimages to sacred shrines. One such shrine was the Cathedral in Canterbury, a town about 50 miles southeast of London, where Archbishop Thomas A Becket was murdered in 1170. The pilgrim’s often traveled in groups from companionship and protection. Chaucer’s masterpiece, The Canterbury Tales, introduces a group of “nine and twenty” pilgrims, one of whom is Chaucer himself. These pilgrims appear first at the Tabbard Inn in Southwark, near London, and later on the road to Canterbury. The Canterbury Tales, is a frame story; that is, a story that includes, or frames, another story or stories. Chaucer’s frame is the pilgrimage, which he originally planned as a round trip but which remained incomplete at his death. Within this frame are 24 individual stories the pilgrims tell. Chaucer did not invent the frame story device. The same structural scheme had been used centuries earlier in The Thousand and One Nights, and Boccaccio, an Italian contemporary of Chaucer, used it in Decameron, published about 1350. Chaucer’s handling of his pilgrimage frame is brilliant. The stories are mostly familiar ones, superbly retold. Perhaps even more impressive than the stories and the storytellers. Chaucer’s pilgrims, all of whom are introduced in his Prologue, are memorable, vividly drawn individuals whose personalities are unique but whose character traits are universal. The pilgrims interact with one another; clashes erupt among them as one pilgrim takes offense at another’s tale and proceeds to retaliate with his or her own story. 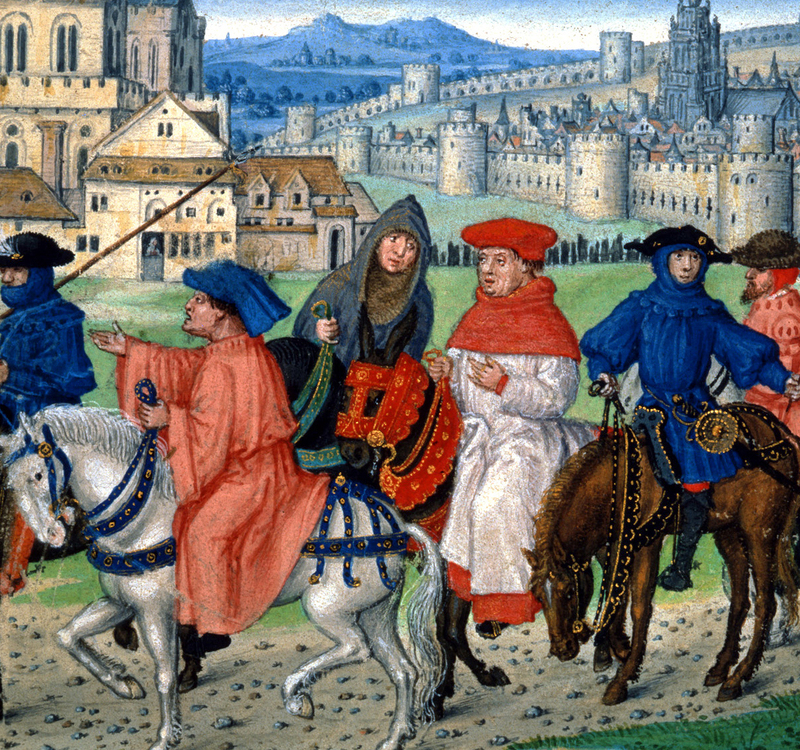 By using the vehicle of the pilgrimage, Chaucer brings together people from 3 main segments of medieval society- the church, the court, and the common people. His pilgrims are drawn from the class structure of feudalism (a knight, a squire, a reeve, for example) as well as from the more open classes in the emerging cities (a merchant, an innkeeper) and the powerful, hierarchical church of the time (a nun, a friar, a pardoner). 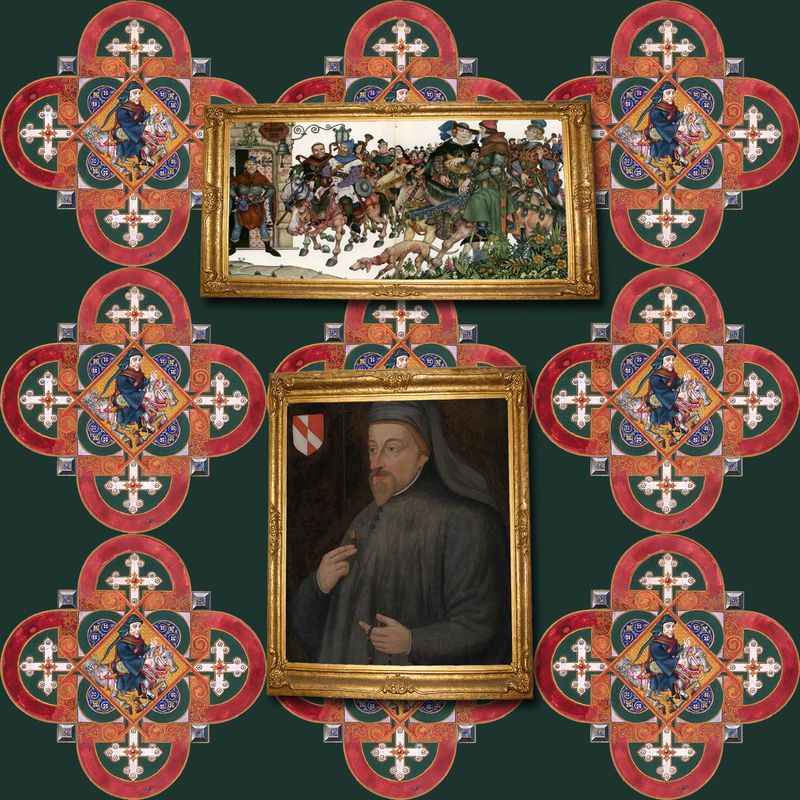 Chaucer’s interest in all these people and the shrewd but affectionate pictures he draws of them make them stand out in such distinct detail that they seem real, alive, and almost modern in their foibles and concerns. “A History of the English Church and People” was complete about 731 AD. Much of the what the world knows about England before 700 AD is based on a history written in Latin by Benedictine monk, Bede, who is often called the father of English history. Bede was the most learned scholar of his day not only in England but in all of Western Europe. Although he wrote 40 books on a variety of subjects, his reputation would be secure on the basis of a single book- his Historia Ecclesiastica Gentis Anglorum. Bede was born in Wearmouth (now the city of Sunderland) on the northeast coast of England. As a child of seven, he entered the nearby monastic school of Jarrow on the river Tyne. A diligent student, he took full advantage of the library at Jarrow, in time becoming a priest, teacher, and scholar at the monastery. He remained at Jarrow for the rest of his life. A contemporary of the unknown author of Beowulf, Bede was fascinated by a broad range of ideas. His writings summarized much of the thought of learning at the time. As the earliest important English prose writer, he concentrated on the Bible but did not neglect science and history. One of his innovations was the dating of events from the birth of Christ, a system that other scholars began to follow. It was through Bede’s work that the Christian chronology in use today became common throughout Europe. Bede had a deep love for his native island and its people, which led him to write his History of the English Church and People. 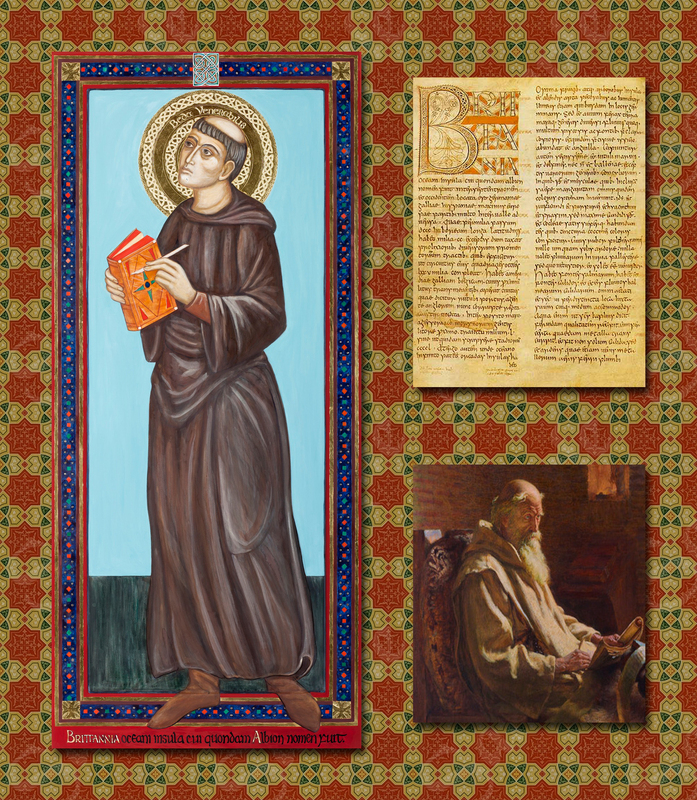 In working on his history, Bede gathered information from many kinds of documents, interviewed knowledgeable monks, and in general, proceeded very much like a modern historian, although he accepted as fact some miracles that a modern historian would not. This was the way of the people back then though. In the History of the English Church and People, Bede describes the conquest of the Anglo-Saxon tribes and the fortunes of the various small fiefdoms that spread across the land. His primary concern however, was the expansion of Christianity and the growth of the Church in England. He wrote in Latin, the language of scholarship in his age. There are several surviving manuscripts, however, that have the Old English text in additions to Bede’s Latin version. He became famous throughout the land as one of the most learned scholars of his age, despite the fact that he never ventured beyond Northumbria. In the century after his death, Kind Alfred translated Bede’s history from Latin into English. In the same century, the word Venerable was first applied to his name to honor his wisdom and achievements. The honor was well deserved. The Venerable Bede was largely responsible for what was sometimes called the Christian Renaissance in 8th Century England. Historical writing is a factual narrative or record of past events. Unless a historian has actually observed events being described, he or she must rely on outside sources (which is generally how it’s done). These sources include testimony from living witnesses, accounts in letters or memoirs, and records from courts, businesses, churches, armies, or other groups. Today’s historian has libraries of books, newspapers, and films to consult, as well as unwritten records, such as buildings, artwork, and various physical remains of bygone days. An enormous amount of historical material exists. This was not the case in Bede’s time. English monastic libraries had modest collections of documents that Bede read, cross-checked, and evaluated. He made excellent use of the limited resources he had. Bede was an innovator among historical writers, and if he sometimes accepted the unlikely tale as truth, he did so far less often than other scholars of his era. Also, the fact that he sometimes did is apart of history as well, as almost everyone would have. Exile means “separation or banishment from one’s native country, region, or home.” The theme of exile recurs throughout world literature- the medieval Italian poet Dante wrote Divine Comedy after being banished from his beloved city of Florence- but this theme is expressed with memorable sadness and pain in Anglo-Saxon poetry. We cannot understand what exile meant to an Anglo-Saxon warrior until we understand what he meant by “home,” While we identify ourselves as citizens of a certain country, an Anglo-Saxon warrior viewed himself as the follower of a particular lord or king. The notion of loyalty to one’s country, called patriotism today, did not exist. It was the lord himself who commanded allegiance, and of course there were many lords in what is now called England. The Anglo-Saxon word for “lord,” “hlaford,” came form the word “hlafweard,” which means “guardian of the loaf.” The lord was the dispenser of bread and the source of sustenance. He was also the dispenser of the booty won in raids and skirmishes, or a “gold-lord.” Perhaps more important, he guaranteed the security of his followers in a dangerous and uncertain world. In return, he expected loyalty in war. His followers would form his great shield-wall in the thick of battle. The most important symbol of home was the mead-hall (mead was an alcoholic beverage made from fermented honey and water), where the lord and his followers shared warmth of fire, the comfort of food and drink, and the pleasures of hearing poetry recited. 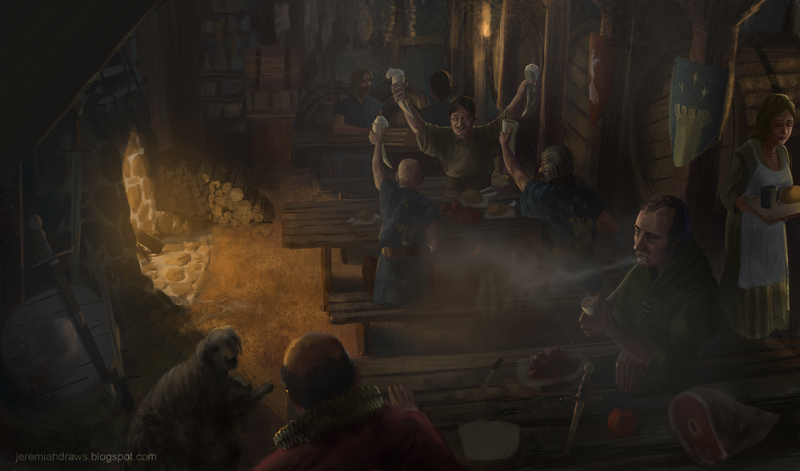 Because we tend to identify home with individual families living in a house or an apartment, it is useful to keep in mind the image of the mead-hall while reading “The Wanderer.” Enlivened with a feeling of fellowship, the mead-hall was smokey, noisy, smelly, and crowded. It was home. The artist of the picture is J-Humphries. Composed by an unknown poet who lived more than 1200 years ago, Beowulf marks the beginning of English literature. Minstrels called scops recited this poem to audiences in England about 300 years before it was first written down. Only one original manuscript of the complete 3,128-line poem survives, but Beowulf is in no danger of becoming extinct. Not only does it have lasting historical importance as a record of the Angles, Saxons, and Jutes in England, but it also tells a hair raising tale that has electrified readers and listeners through the centuries. 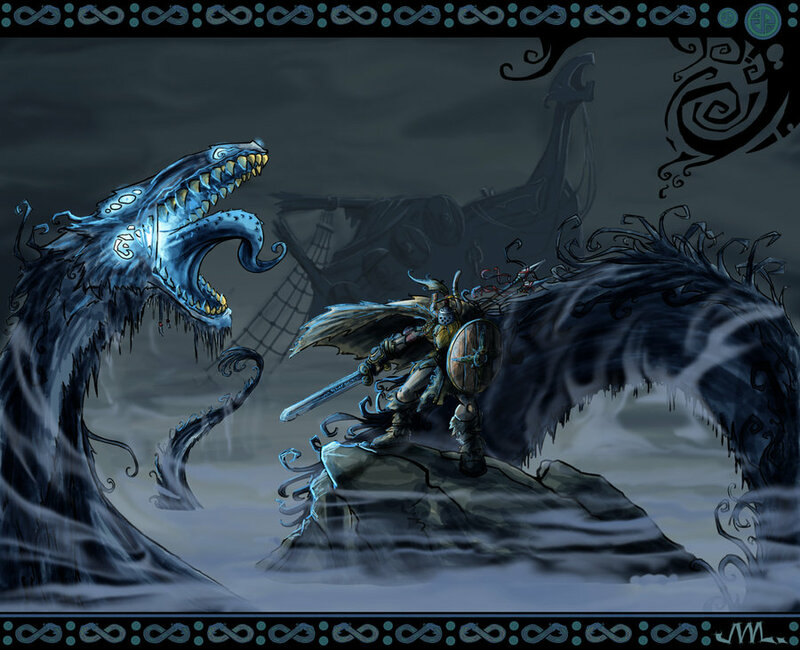 Beowulf, a Great from a region that is today Southern Sweden, sets sail to his homeland to try to free the Danish King Hrothgar’s great banquet hall, Herot, of a monster that has been ravaging it for 12 years. The monster, Grendel, is a terrifying swampland creature of enormous size size whose eyes burn “with gruesome light.” The struggle between Beowulf, a young adventurer eager for fame, and Grendel, a fierce blood thirsty foe, is the first of 3 mortal battles in a long poem. Although the action takes place in 6th century Scandinavia, the poem is unmistakably English. Recited originally in Old English, Beowulf is based on legends and chronicles of the various Northern Europeans who migrated to England. An epic is a long narrative poem, some times developed orally, that celebrates the deeds of a legendary or heroic figure. Few epics predate the Anglo-Saxon Beowulf, including the Greek Iliad and Odyssey by Homer, and the Roman Aeneid by Virgil. Typically and epic features a hero who is larger than life and concerns eternal human problems such as the struggle between good and evil. An epic is presented in a serious manner, often through the use of elevated language. The hero of the epic represents widespread national, cultural, or religious values. Beowulf is one of the oldest European epics. Its hero, Beowulf, embodies the highest ideals of his time and place: loyalty, valor, selflessness, and a sense of justice. He represents good, whereas Grendel represents evil. Throughout Beowulf there is a prevailing yet somewhat uneasy blend of Christian ethics and pagan morality. Against the backdrop of gloom that reflects the Anglo-Saxons’ stoic acceptance of fate, the story applauds the highest virtues of human nature- courage, generosity, faithfulness. Despite its blood and horror, Beowulf is a deeply idealistic narrative. Anglo-Saxon epic poetry, of which Beowulf is the greatest example, has certain distinctive features. One is the two-part line. Each line is separated by a pause, known as a caesura, and there are generally two strong beats per part. Another feature is the kenning, a colorful, indirect way of naming something: The sea is a whalepath; a battle is spear play; the sun is the candle of the skies. The picture was illustrated by artist Musibat-Khan from Pakistan.